In my home studio, I teach private art lessons regularly throughout the year. I have been teaching out of my studio for over 20 years. 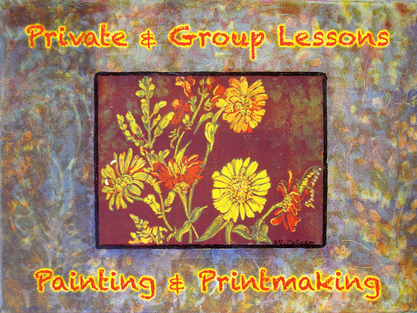 My students range from age 5 to 85 and I offer private and group lessons in multi-media for the young students and watercolor, acrylic and printmaking for adults of all levels. During the summer, I offer two group classes, “en plein air” where we work outside by Penns Creek. Being outside and listening to the sounds of nature and enjoying the company of other artists is truly a delight.